Conceived as an object in the landscape, AZ Sint-Maarten is a human scale hospital that radiates simplicity and serenity – a solid building surrounded by green space and enveloped by delicate brise soleil elements. The realisation of this concept required complex collaboration between the design team, project managers and contractors. Sophisticated technology, design anchored in sustainability, competitive budgeting and patient centered design features were woven together to create this unique environment. 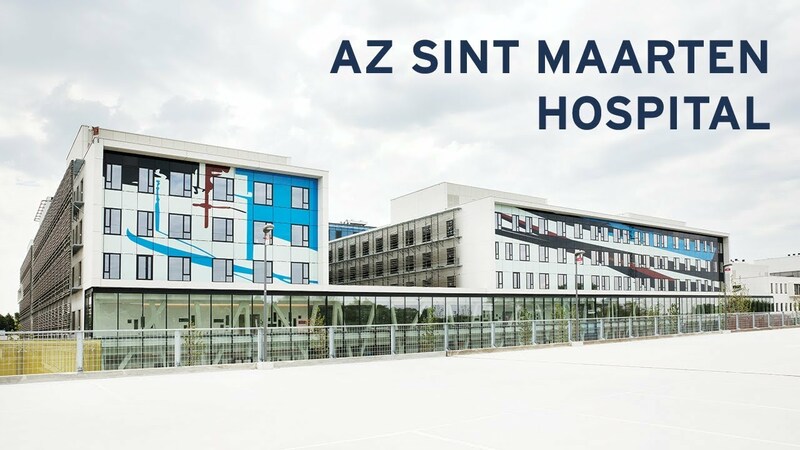 The AZ Sint-Maarten project combines 3 formerly separate hospital campuses, (Rooienberg Duffel, Leopoldstraat and Zwartzustersvest Mechelen) into one brand new building along the Mechelen ringway in Belgium. On Friday June 8th, 2018, Jan Ennekens (General Manager of AZ Sint-Maarten) cut the tape of AZ Sint Maarten by VK Architects & Engineers. This event took place more than a decade after the architectural firm won a 2007 architecture competition to design the regional hospital. This new hospital includes 654 inpatient beds (about 50% of which are single bedrooms), 96 outpatient beds and an ample consultation area. Approximately 1,700 people are employed by the hospital. The designers began with anchoring the project in the green space surrounding the site which inspired strategies for building orientation, materials, volumetrics and accessibility. The result was optimal integration into the landscape, with a compact design that ensures a human-scale. In addition, a waving brise soleil solar protection adds a playful, and also delicate element: a second skin, protecting patients and personnel. Spatial arrangements and functional relationships are key in hospital design. In close cooperation with the team from AZ Sint-Maarten, functional floor plans, flow models and relational diagrams were refined into a design with a clear care vision: both outpatient and inpatient care, and chronic and acute patients are separated; hospitalisation departments are grouped per care floor and vertically connected to the medical technical services in the base. Patients have nearly continuous visual contact with the world outside. In close consultation with the hospital, much attention was paid to patient comfort in the form of privacy considerations, ergonomics, and environment and safety features. By including a multitude of glass surfaces, patients have nearly continuous visual contact with the world outside. To achieve this, the architects specified windows and joinery complying with the highest performance and thermal insulation criteria as set out by Belgian standards. CS 77-HI windows from Reynaers Aluminium complied perfectly with this requirement, while also literally creating a window to nature and providing the building with plenty of natural light. In addition to providing each patient with a view towards the surrounding greenery, each patient has access to their own sanitary facilities and an internet-TV with various customizable functions. In addition to creating a more human scale, the compact nature of the building design required less building envelope per square meter, which in turn reduced construction costs during the building phase, as well as energy loss savings over the longer term. Further optimizing the lower energy needs of the building, a brise soleil was applied to a number of façades to form a sunscreen solution. VK Architects & Engineers designed this unique brise soleil solution using curved lamellas in a wave pattern. The inclination and form was studied by VK Architects & Engineers to achieve a highly functional sun shield. The design process included the production of a building simulation model to monitor the thermal comfort in patient rooms. In addition to optimal performance, the design of the brise soleil lends a unique identity to the building, while still affording patients views from their bed to the surrounding landscape. The unique design was indicated in the tender file as intellectual property of VK Architects & Engineers. Moving from design to production of the brise soleil, the contractor and Reynaers Aluminium came up with a technical proposition by tailoring the existing BS 100 system to the design needs. This solution consists of no less than 63,000 meters of profiles. This delicate and functional ‘skin’ adapts to the façade orientation. For example, the lower position of the sun in the west and east requires smaller distances between the brise soleil slats than the higher position of the sun in the south. Much attention was also paid to the transition from public to semi-public and private spaces by playing with degrees of brightness. As the construction of the hospital was submitted to public tendering, VK Architects & Engineers could not select any preferred manufacturer nor subcontractor beforehand. Following award of the contract, the contractor MBG and subcontractor Couwenberghs-Schellens proposed Reynaers Aluminium. After a tour of the Reynaers’ facilities, Reynaers Aluminium was brought on board the project team. Starting from the detailed design of the brise soleil by VK Architects & Engineers, a close collaboration between manufacturer, contractor and architect was established in order to come to a workable technical solution. ‘One of the key elements in this project was the wind tunnel test to verify the overall resistance to wind loads and acoustical impact. This test convinced everybody of the quality of the technical solution provided by Reynaers,’ says architect Erik Vereecken, Project Director Healthcare at VK Architects & Engineers. AZ Sint-Maarten is unique as it was an early adopted of BIM (Building Information Modelling) from 2010. Working with a 3D model gave the opportunity to check different aspects of the design and walk through the project before it was built. Long before construction began, airflows, mechanical and thermal simulations were undertaken with simulation data evaluated further to optimise the design and keep budget competitive. Solid yet delicate, compact and highly functional in design yet expansive in feeling, AZ Sint-Maarten is truly an exceptional example of a healing environment that nurtures and supports patients, families and those who work within the healthcare environment.